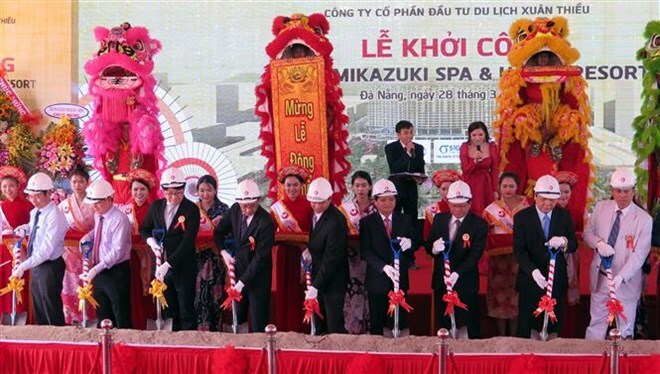 Da Nang (VNA) – Xuan Thieu tourism investment JSC and Mikazuki Group of Japan began construction to expand the Xuan Thieu tourism site in Lien Chieu district, the central city of Da Nang on March 28. The 100-million-USD project covers an area of 12.23 ha along the Nguyen Tat Thanh coastal road. As a Japan-style resort area in Da Nang, the site will consist of a hot spring and water park area, the first dome entertainment area in Da Nang, and sea view restaurant, and hotels. Yoshimune Odaka, General Director of Mikazuki Group, said his firm selected Da Nang to invest in due to its beautiful beaches, adding that the company wants to create a Japanese-style resort tourism site in the coastal central city. Vice Chairman of the municipal People’s Committee Le Trung Chinh said the locality aims to attract more investment in 2019, noting that the project is hoped to contribute to promoting socio-economic development in the city and enhancing cultural connections between Da Nang, and Vietnam in general, with Japan.